If you live in MN you are probably a bit depressed about the weather lately. It was seeming all spring like a week ago. We had just had what we all thought was our last snowfall and things were warming up nicely. The garden was starting to wake up and it actually seemed like the long winter was giving up the ghost finally. Nope. If there's one thing to learn over and over again in this neck of the woods it's never to relax into a weather forecast. 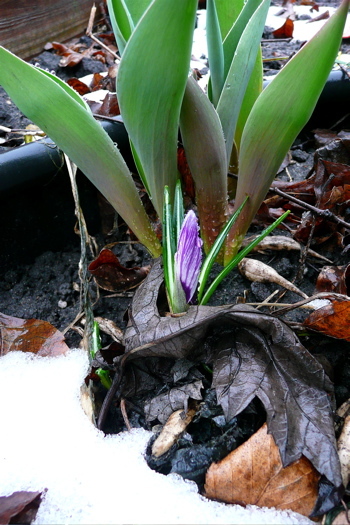 It doesn't matter how many times you have to go through it - "ok, NOW it's spring, no more snow" - then, BAM! More snow. You still find yourself a sucker every year. There's a very good reason most of us don't pack away the sweaters and boots until well into summer - we don't trust the spring. She's a prankster around here and is just waiting to pull the warm flowered welcome mat out from under you when you least expect it. So, I was very delighted to find this little ray of hope poking it's pretty little head up out of the cold soggy dirt when I got home. 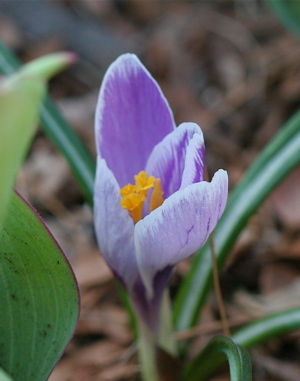 Funny thing is, my crocus have never bloomed on time. For some odd reason they have always bloomed after the tulips have started. Great year to pick to bloom on time guys! I have to say it made me feel a little warmer despite the icy slap of winter's (presumed) goodbye still stinging my cheek. Here's hoping you each find your own little ray of hope blooming in the cold. This year, one. Oh well, I'm gonna need to dig up all the spring beds, because most of my tulips have all divided beyond recognition as well. I'm starting to understand the whole planting tulips as an annual thing. Two years ago, I dug up a bunch of the tulips that divided, and split them. I got some special bulb food and replanted and fed them. I got even less tulips to bloom the next spring though, and they seemed to divide more. Oh well, perhaps it's time for some new color anyway. Anyone have any suggestions about bulbs? Anything I should be doing differently?